R.A.F. issue, stores reference. 22c/67. Grey coloured sponge rubber cushion inserts. 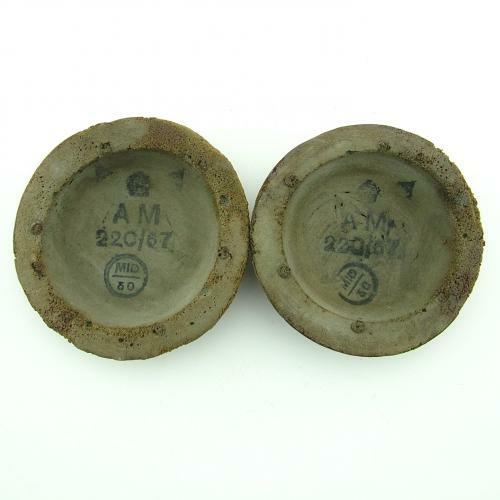 These were fitted inside the earpieces of B-types and other flying helmets with zipped earpieces. They were intended to provide extra soundproofing and have the additional benefit of improving the look of your helmet. Somewhat dusty/grubby and although the surface has dried and become a bit crusty they remain quite flexible. Air Ministry King's crown and reference markings. One pair only. Far rarer than the RCAF marked examples. Stock code HDRF1.